Lake Buckhorn If you don’t know about Chaco Canyon and the Chaco Canyon National Historical Park, I hate to be the one to tell you, since it is an incredibly significant archaeological wonder here on the Navajo reservation in New Mexico, and so fragile and, frankly, spiritual that as a visitor you almost feel both honored to be there on one hand and reticent almost to speak above a whisper until you depart. Camping there you feel the stars are at your fingertips and the quiet is literally unearthly as if the Anasazi or ancient ones are still right at your shoulder. Chaco Canyon is more than 30 miles off of a dirt road off the highway to visit, so few do, relatively speaking. You have to mean to go there. If you do, the rewards are amazing. My partner and I were so moved that a year later after our last visit, we named our son, Chaco when he was born. 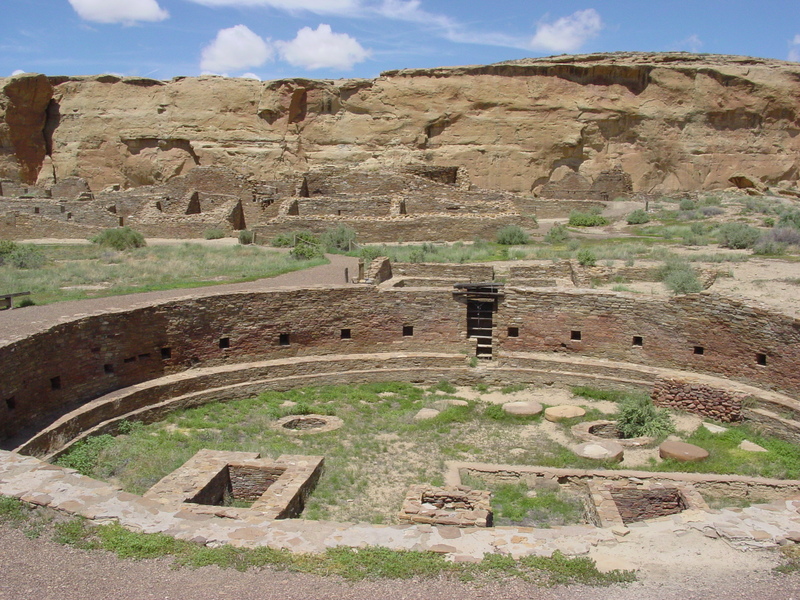 For those unfamiliar with the history, there was a time when Chaco Canyon was the largest city within the footprint of the continental United States. Between 850 C.E. or Current Era and 1250 C.E., this canyon in the San Juan Basis was the hub of a 10000 square kilometer Pueblo culture with roads leading in every direction as trade routes within an amazing network. After 400 years, this sophisticated civilization disappeared in an unresolved mystery with speculation ranging from the loss of arable land for crops for the population to discussions about cannibalism. Now, the continued surge of oil and gas exploration and development, especially through fracking, is muscling in on Chaco Canyon and archaeologists, environmentalists, and Native American activists have been battling against the odds to try and protect this incredible treasure. They need all the help that we can give them. A map in Science magazine dramatically illustrates the scope of the problem as oil and gas leases discolor much of northwestern New Mexico. In a temporary victory, the Bureau of Land Management created a 16-kilometer buffer around the park itself. Campaigners are trying to push the federal government into making the buffer permanent. Archaeologists are arguing for an even wider protected region. They have identified 200 great houses as far away as Colorado and as far south as Mexico along Chacoan roads five to ten meters in width and theorize that there may be almost as many unidentified and undiscovered. The least any of us can do is lend support by signing one of the many petitions to stop the fracking and development in the Chaco Canyon area. One of them is available on the website of the Native Voice Network. For those who can do more, please step up so Chaco Canyon can survive for all of those who love it and for those of you who will one day want to visit and share the experience. This entry was posted in Ideas and Issues and tagged Chaco Canyaon, environmental issues, fracking, Navajo, New Mexico by Wade. Bookmark the permalink.